The subject of children's art has been dear to my heart for many years. I am not alone in finding a creativity that delights the soul in the work produced by children. Artists have looked to children for inspiration in recognition that the process children use is spontaneous and from the heart. As adults we tend to think as we create and fail to trust being in the unknown, the place where creativity springs from. Paul Klee often observed his son Felix's drawings to remember to bring this quality back to his own work. The Reggio Emilia Approach is in the forefront of progressive education alternatives for children from birth to age five. Introduced in Italy in the town by the same name after the devastation of World War II, educators wanted to discover a way to avoid the mistakes of the past. The educators vowed to never let Fascism occur again and designed the schools to foster community and inquiry-based learning. 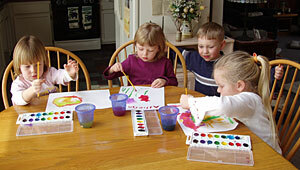 Reggio programs use emergent curriculum, drawing out the children's own interests. As teachers, the task is to listen and then to record the process of learning to revisit later. This is a much different model from our current American idea of teaching, in which we are spoon-fed information to be memorized. The work of John Dewey, Vygotsky, Erikson, Maria Montessori and Piaget were studied by the Italians to develop the approach. Reggio classrooms are to be aesthetically pleasing, with art materials arranged beautifully and always available to the children. Children explain their ideas using the materials. "The Hundred Languages" is the way the Italians talk about ways in which children express themselves and their ideas. In our school, Happy Hands, children wrap scarves in a language of costume and make believe they are towers or heroes or horses. Colored masking tape becomes constructed environments of architectural splendor. Blocks can become machines with magical properties that pull or protect. The teachershave no shortage of material to record and to discuss with enthusiasm as thechildren's investigations and explorations of their world and who they arein their community of friends shapes their life here in the school. Visit the children's art exhibit at the River Garden during Gallery Walk, and I invite you to look a little closer. Perhaps you, too, will have a Picasso moment. -- Kay Curtis is Director at Happy Hands in Brattleboro, Vermont, a school inspired by the Reggio Approach. For further information, call her at 802-257-7235.